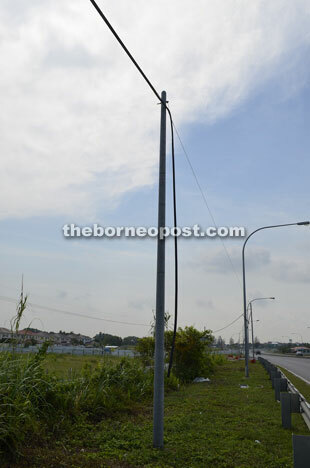 MIRI: Residents of River View Park in Senadin are up in arms over the rampant theft of telecommunication cables, which has repeatedly left them without telephone and Internet services. A telecommunications pole which had its cable stolen this week. One resident, who only wished to be known as Daniel, said he believed the same culprits were responsible for the problem which has occurred for the last few years. “We’ve lodged complaints with TM (Telekom Malaysia) and they’ve come over several times already to fix the problem. However, the culprits will come back and steal the cables again, which really annoys us as we pay for the services,” he said. Daniel, who is in his 50s, added that the area has been left with no Internet connection for about a month now. He said residents in the over 50 houses are mostly university students, businessmen and offshore workers, who depend on the Internet for their work and studies. According to him, the thieves normally choose to steal the cables before or during festive occasions. “It is actually very visible as the cables are very near to the road. They must be very daring and well-equipped as they have to climb high up to cut off the cables,” he pointed out. He added that police reports have been lodged but the problem still persists. Daniel called on the authorities concerned to take action and resolve the problem immediately.